Handmade 22"x90" painted and/or dyed Shibori style 100% SUSTAINABLE CREPE DE CHINE SILK SCARF with rolled hem. Multiple uses...shawl, sarong, hair, head, neck, tie, etc. BE CREATIVE! ONE OF A KIND WEARABLE ART. When it's gone...it's gone baby! Soft and luxurious light weight breathable 100% crepe de chine silk that is a great fashion accessory in spring/summer and will keep you warm in fall/winter with superb style. Our designs are fun, elegant, edgy, sophisticated and versatile. They can be worn with jeans and a t-shirt, bathing suit, dress, leather jacket, black-tie, or a business suit. It's up to you... EASY TO CLEAN -- hand wash separately in cold water (color may bleed) with mild detergent, drip/line dry, and iron while slightly damp or mist to be wrinkle free. It's that easy. You may also dry clean. 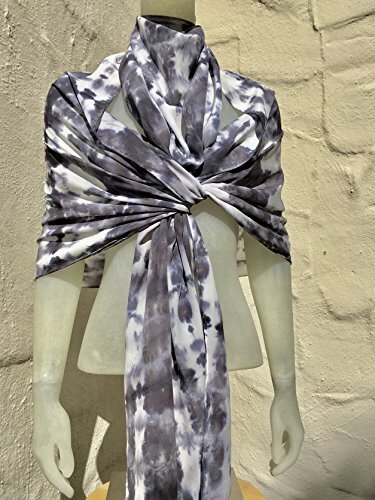 Please know that these pieces are hand painted and/or dyed by Scarf Spree in the SF/bay area CA. They are not made by factory/machine, and therefore lines and designs are not perfect by intention. They may have little spots or flecks of color that vary, and ultimately add to the character of the design. Please contact us if you would like multiples, or a custom order. We can make something special just for you!! Thank you for your interest and your purchase. We look forward to creating for you!! If you have any questions about this product by Scarf Spree, contact us by completing and submitting the form below. If you are looking for a specif part number, please include it with your message.